The module Quote Lines is used to create quote lines of a quote. A quote line can only be deleted if the quote is unlocked and there is no reference to an inquiry line. Actions show functions for the module Quote Lines. Add Article: Is used to insert a new quote line. An article must be located in either: article templates, articles, stock, or project articles. Article Templates only provide static properties, where the others provide all properties. To ease the search for an article, the search can be done across properties and property values. When selecting properties at the top, only articles matching all properties will be shown. 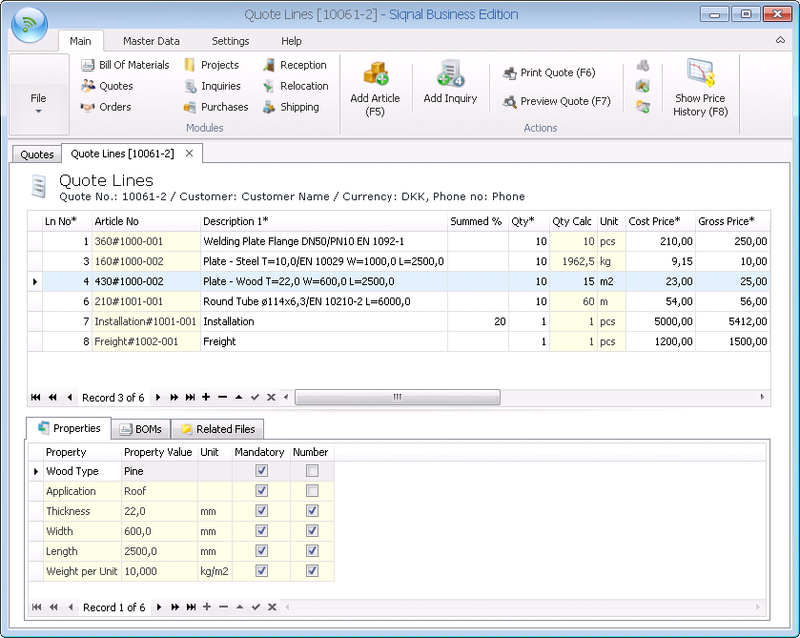 Once the desired article is located and added, a new quote line is created and the quote line information must be entered and dynamic properties, if an article template was selected. Add Inquiry: It is possible to create an inquiry for all articles on the quote. The action Add Inquiry is a wizard. Copy Cost Price to Articles: Normally cost prices come from purchases, but its also possible to copy the entered cost price to the module Articles, so next time the article is used on a quote, the cost price will be suggested. Copy Cost Price to Stock: Normally cost prices come from purchases, but its also possible to copy the entered cost price to the module Stock, so next time the article is used on a quote the cost price will be suggested. Copy Gross Price to Price List: Its possible to copy the entered gross price to the module Price List, so next time the article is used on a quote the gross price will be suggested. Ln No*: Mandatory line number for the quote line, which is automatically provided, but can be overwritten. Article No: When a new line is created with an article from Article Templates, a variant number is automatically assigned to the article no, and a new line is added to the module Articles. If an article is used from the modules Stock, Articles and Project Articles the article no is kept as it is. Summed %: If the field is entered with a value, the field Net Price will be calculated as a percent of all other lines above and under the field. The field Qty will be set to one. Rest of the fields will be locked except the field Cost Price. When the cost price is entered, all the other fields will be calculated. Qty*: Number of items to quote. The field is mandatory. Cost Price*: If the article comes from one of the following modules: Articles, Stock or Project Articles, the cost price can be suggested otherwise the cost price should be entered. If the article comes from the module Article Templates, it always should be entered. Gross Price*: If the article is registered in the module Price List, the gross price will be suggested from the column Sales Price, otherwise it should be entered. Discount*: Its possible to enter discount as an amount, the fields Discount %, Net Price, Earning, Earning % and Total Price will then be recalculated. Discount %: Its possible to enter discount as a percent, the fields Discount, Net Price, Earning, Earning % and Total Price will then be recalculated. Net Price*: Its possible to enter Net Price, the fields Discount, Discount %, Earning, Earning % and Total Price will then be recalculated. Earning: Its possible to enter Earning as an amount, the fields Discount, Discount %, Net Price, Earning % and Total Price will then be recalculated. Earning %: Its possible to enter Earning % as a percent, the fields Discount, Discount %, Net Price, Earning and Total Price will then be recalculated. Total Price*: Is a calculated field. Customer Delivery*: Is the date for delivery to the customer. Is a mandatory field, and the date of today is given by default. Description 1*/Description 2: Shows the formula result of the article based on the article type, including static and dynamic properties. If no formulas are used, description 1 or 2 is direct given from the module where the article is registered. Inquiry No: Show the inquiry no as a reference between the quote line and the inquiry. The action Add Inquiry gives the inquiry no, and can only be deleted if the inquiry is deleted. Ln No: Show the inquiry line no. The action Add Inquiry gives the inquiry line no. Delivery Date: Show the supplier delivery date. The action Add Inquiry gives the supplier delivery date. Properties tab: Shows properties for articles on quote lines. When an article template is located, dynamic properties must be entered here. BOMs tab: If the article has a reference to a Bill Of Material it will be showed here on this tab. 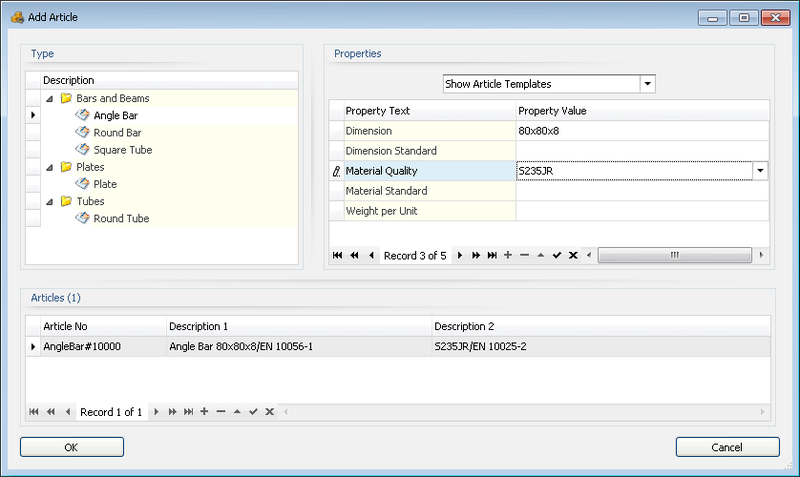 With the function Calc is it possibility to calculate the cost price for the article on the fly. The function Calc use latest prices from purchases. Related Files tab: On this tab it is possible to register files that are related to the quote line, drawing and text files etc. The files are saved into the system and are placed in the folder specified in the popup Client/Server Setup and with the Shared file path viewing below. Use append (+) bottom to add files. Up and Down are used to alter the order of files.